Being Sunday we needed to look for a suitable location for lunch. In the end we decided to walk to the Thai restaurant in Rugby and partake of their Sunday lunch smorgasbord. It’s not cheap, but we both like Asian food. Albeit, it’s western style Asian food! 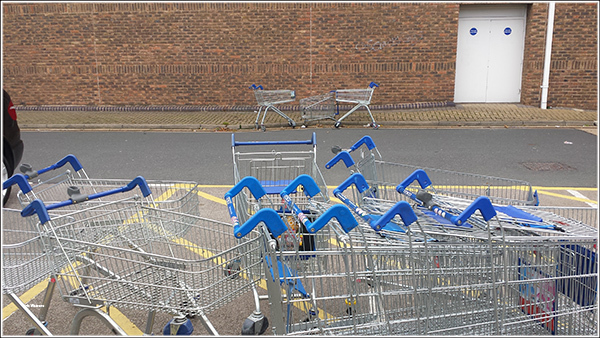 The route took us down the side of Tesco where the trolley shop stewards were having a meeting about the previous night’s events. It must have been a humdinger of an affair because over the far side Bob and Alf were trying to get a paralytic Trevor back on his wheels. Yesterday I mentioned Homebase was moving to a new location behind Range. 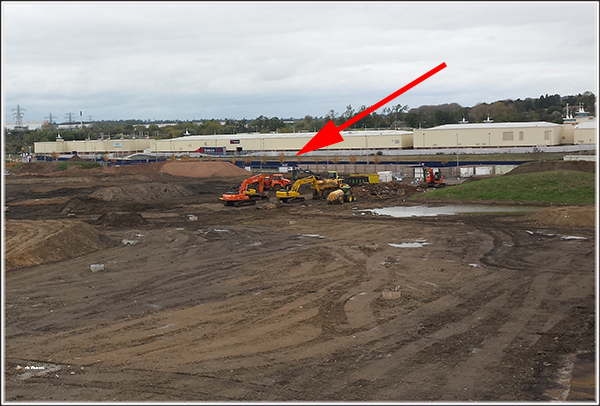 I managed to take a photo of the site today from the top of the pedestrian bridge over the railway line. There is a sign stating the opening is in Spring 2015 which leads me to believe the building will probably be a simple steel framed structure with a concrete base and clad in metal sheeting. In other words…. a tin box! Clocks went back an hour overnight. That obviously didn’t include my automatic watch because we arrived at the restaurant an hour early. Time was wasted usefully employed browsing through Asda and the shops in the mall before returning to the restaurant for lunch. It’s obviously very popular with the local Asian community as they didn’t have a vacant table for two without some serious searching. 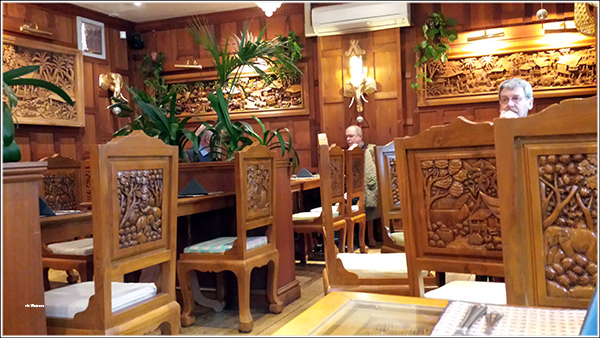 It seems slightly strange to enter a Tudor style building and find the interior decor Asian. My days of being able to stuff large quantities of food down my throat appear to be over. Meanwhile Jan liked the food so much she subsequently had it again. Nothing against the food… it’s our stomachs. In the late afternoon youngest son and partner arrived on the train to visit us and we all went to the Steam Turbine pub for dinner. both Jan and I sensibly ordered a small meal and still struggled to eat it! Daniel and Joyce gave a good account of their recent 7 week backpacking holiday through South America before we headed to the nearby cinema. Jan wasn’t interested in the film and went back to Waiouru to watch Downton whilst Daniel, Joyce and I stayed to watch the latest Brad Pitt film, Fury. It’s based on events surrounding an American tank crew in the last days of WW2. I thought Brad Pitt acted rather well but I didn’t find the film that interesting.